What must it have been like to spend Christmas stumbling behind the baggage train during the Peninsula War's hellish retreat to Corunna in 1808, aged seven? To have been sent 'home' to England as a child of six, there to endure a decade separated from your parents, shivering in the cold climate of a strange land and the chilly atmosphere of a boarding school, before being allowed to return to your real home in India, now an adult? 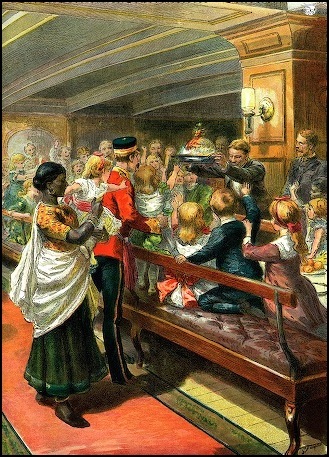 Or, if you were a less privileged nineteenth-century child, to have called a corner of a smelly barrack room 'home'? To have lived in eight houses and to have attended nearly as many schools by the time you were sixteen during the Cold War era? And, in the twenty-first century, to try to deal with the fear that when your father kisses you goodbye before going on a 'work trip' to the Middle East, there is a very real chance that you may never see him again? If your parent was, or is, a serving soldier, some of the latter scenarios will strike a chord with you. Yet all too often such stories and memories, many of them directly bound up with momentous events in British history, have gone unrecorded and have been lost forever. The Army Children Archive (TACA) was established in 2007 by former army child Clare Gibson to collect, record, preserve and also raise awareness of the unique aspects of growing up as the child of a serving soldier in the British Army, whether that growing up was done during the seventeenth, eighteenth, nineteenth, twentieth or the twenty-first century. Although it will always be a work in progress, we hope that it will provide a useful source for social and military historians, and particularly that it will interest former and current army children, who, on the one hand, may find that it ignites some sparks of recognition that in turn trigger a string of memories or, on the other, may enjoy the sense of having a rich history all of their own. We hope that you will enjoy browsing through The Army Children Archive online. You'll find the latest additions to the archive on the TACA LATEST page, and if you scroll to the bottom of many other pages, you'll find links there to more images and memories. And if you feel moved to contribute some information, memories or images of your own, please do! A book by The Army Children Archive’s founder, Clare Gibson, was published by Shire Publications Ltd in 2012. Click here for more information about Army Childhood: British Army Children’s Lives and Times, and here to order it from the publisher. News of TACA updates is regularly posted on Facebook (click here or search for 'The Army Children Archive (TACA)' on http://www.facebook. com) and Twitter (click here or search for 'ArmyChildren' on http://www.twitter.com) for friends and followers. 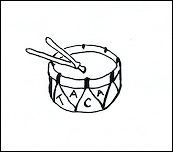 There is also a TACA blog, ‘TACA drum’, which can be read at: http://tacadrum.blogspot.com. If your parent's career as a regular soldier in the British Army meant that you grew up as an army child, or are still doing so, do consider contributing your own story to The Army Children Archive (TACA). Not only will others be interested in reading about your experiences, but your contribution will also be preserved for historians to learn from in future. To contribute, or to request further information, please use the online form on the 'CONTACT TACA' page. 'I am a daughter of the regiment!' proclaimed Joanna Lumley on 21 May 2009, on celebrating her famous victory on behalf of Gurkha veterans, who now have the right to settle in Britain if they wish. Former and current army children will know exactly what she meant, and if you are in any doubt, the contributions and information on TACA's pages should prove enlightening. For further details of Joanna's army-child credentials, and a list of some other famous army children, click here: http://www.archhistory.co.uk/taca/famousarch.html. The September 2010 issue (Vol 26, No 11) of Family Tree Magazine included 'A poignant story from postcards', a hidden-lives-revealed-type article focusing on an army family by Clare Gibson. 'Married quarters: then and now', an overview of quartering history by Clare Gibson, featuring images from TACA's picture collection, appeared in the Winter 2009 issue (Journal 77) of the AFF Families Journal (the official magazine of the Army Families Federation). Family History Monthly magazine's September 2009 issue (Issue 173) featured TACA in a piece, by Clare Gibson, on how to trace army children entitled 'Following the Drum'. The September 2008 issue (Issue 73) of the National Archives' Ancestors magazine included an article ('Minors on the March', by Clare Gibson) that explored how army children fared during the Napoleonic Wars. The 'Reconnaissance Report' section of the August 2008 issue (No 16) of Britain at War magazine focused on TACA, while BBC Who Do You Think You Are? Magazine listed The Army Children Archive (TACA) among its best websites for researching army ancestors in its May 2008 issue (Issue 9). TACA had already featured in BBC Who Do You Think You Are? Magazine (February 2008, Issue 5), as well as in Family Tree Magazine (February 2008), Family History Monthly (January 2008, No 132), Practical Family History (January 2008, No 121), Military Illustrated (January 2008, No 236) and the AFF Families Journal (Spring 2008, Issue 70), all British publications.